Markham, Ontario, March 22, 2017 – How often have you arrived at your hotel early only to find that your room is not ready? Your bags can go into the bell stand closet, but you still want to get to your room as soon as possible. Maestro PMS understands this and its new Housekeeping App has you covered. Scenario: A guest arrives at the hotel. The room is not yet ready. Room Status Updates via Staff Handheld Devices and Maestro Front Office hotel management software. Maestro’s solution to this familiar issue is its integrated mobile app that lets room attendants update the room’s status in the Maestro Front Office hotel management software from their handheld device. When Maestro’s Front Office gets the new status it automatically texts guests that their room is ready. Maestro PMS is the preferred cloud and on-premise PMS hotel management software solution for independent hotels, resorts, conference centers, and multi-property groups. Customers asked for a simple, effective way to engage with guests. Maestro PMS developed it. Mobile natives rely on their handhelds. Maestro PMS empowers hotel staff to do likewise. “Travelers today are mobile natives who rely on their handheld. To engage guests where they communicate, we integrated our housekeeping app with Maestro Front Office. At Breezy Point Resort, a Personal Guest Connection via Maestro’s Housekeeping App. “We provide Maestro’s Housekeeping App to appropriate staff,” said David Spizzo, Assistant General Manager and Vice President of Breezy Point Resort. The property purchased inexpensive Kindle Fire tablets for on-property use by housekeeping staff. Maestro’s new Housekeeping App runs on any mobile device, including iPhone, Android, Windows Handheld and tablets. For maximum flexibility the app can be used with hotel-provided handhelds or with a housekeeper’s own device. 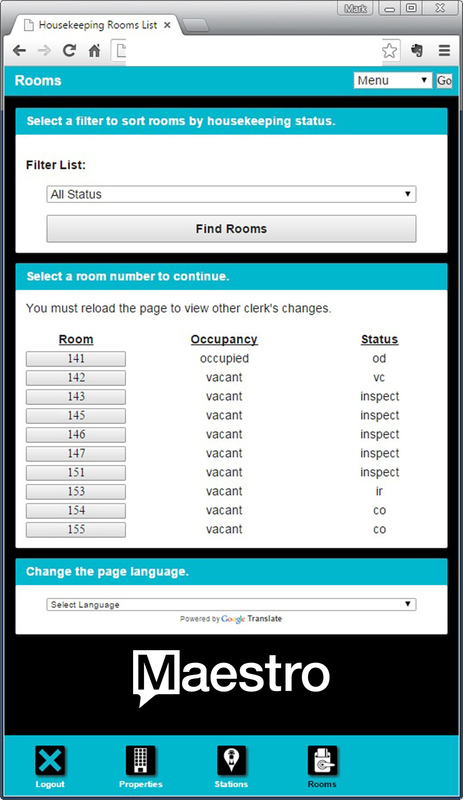 The app manages PMS updates such as ‘attendant in room,’ vacant/occupied, clean/dirty, or property configurable room statuses. The Housekeeping App is easy to install and use and relies on the property’s wireless network without dependence on an internet connection. Maestro PMS delivers revenue-generating tools and services that increase profitability, drive direct bookings, centralize operations, and provide personalized guest service to keep guests coming back.